Background: The Halifax-based INSPIRED COPD Outreach Program™ is a facility-to-community home-based novel clinical initiative that through improved care transitions, self-management, and engagement in advance care planning has demonstrated a significant (60%–80%) reduction in health care utilization with substantial cost aversion. 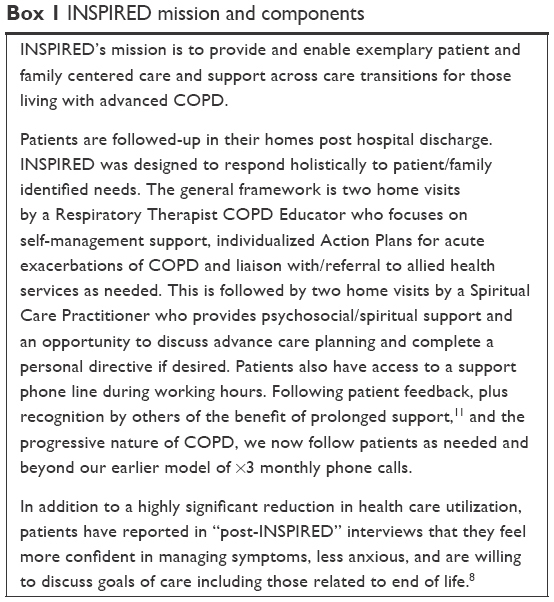 By assessing the feasibility of expanding INSPIRED into the emergency department (ED) we anticipated extending reach and potential for positive impact of INSPIRED to those with acute exacerbation of chronic obstructive pulmonary disease (AECOPD) who avoid hospital admission. Methods: Patients were eligible for the INSPIRED-ED study if >40 years of age, diagnosed with AECOPD and discharged from the ED, willing to be referred, community dwelling with at least one of: previous use of the ED services, admission to Intermediate Care Unit/Intensive Care Unit, or admission to hospital with AECOPD in the past year. We set feasibility objectives for referral rates, completion of action plans, advance care planning participation, and reduction in ED visit frequency. Results: Referral rates were 0.5/week. Among eligible patients (n=174) 33 (19%) were referred of whom 15 (M=4, F=11) enrolled in INSPIRED-ED. Mean (SD) age was 68 (7) years, post-bronchdilator FEV1 44.2 (15.5) % predicted, and Medical Research Council (MRC) dyspnea score 3.8 (0.41). We met feasibility objectives for action plan and advance care planning completion. Frequency of subsequent ED visits fell by 54%. Mean (SD) Care Transition Measure (CTM-3) improved from 8.6 (2.0) to 11.3 (1.3), P=0.0004, and of 14 patients responding 12 (86%) found the program very helpful. An additional 34 patients were enrolled to our regular program from those referred but ineligible for INSPIRED-ED (n=27) or unwilling to participate (n=7). Conclusions: INSPIRED-ED outcomes were generally positive, however referral and enrollment rates were lower than anticipated. Despite the potential of early self-management education, the ED may not be the ideal recruitment setting for home-based programs. Our findings underline the importance of conducting preliminary work to ascertain best settings for implementing new self-management education initiatives. COPD self-management can be complex and some patients and their families experience it as burdensome and time-consuming.6 Many of those who live with COPD also live with negative determinants of health including disadvantaged social circumstances. They often experience feelings of shame and worthlessness as well as a sense that life is increasingly becoming unpredictable, uncontrollable, and meaningless.9 A sense of “learned helplessness”, where people believe they will not succeed based on past failures, may augment this difficulty for some.10 A loss of hope compounded by fatigue can overwhelm their capacity to cope and/or problem-solve,10 explaining in part why some patients seem unable/unmotivated to adhere to complex COPD therapies. Such behaviour patterns contribute to the “revolving door” pattern of ED visits that is so familiar to these patients and to those who care for them. Local data indicates that approximately 85% of patients with COPD-related issues are seen in the ED but not admitted (data on file, Queen Elizabeth II Health Sciences Centre ED database, 2014). We hypothesized that by expanding INSPIRED to the ED setting (see Box 1 for mission and program summary) we would be better able to address gaps in self-management skills, capacity, and/or motivation for a substantial cohort of our local population and develop care pathways that are more cost-effective and achieve better outcomes for these patients/families and the health care system over the longer term.11 In addition, we chose to assess the feasibility of this approach before any significant extra investment in such a strategy. Is an expansion of the INSPIRED program to the ED setting (INSPIRED-ED) feasible leading to increased efficiencies and better outcomes for patients living with COPD? 40%–60% reduction in ED visits (vs previous rate measured over comparable period) for enrolled patients. Patients were eligible for enrollment in INSPIRED-ED if they were identified through an ED visit, but not admitted, were diagnosed with COPD through spirometry, or suspected COPD, were ≥40 years, lived in the Halifax Regional Municipality, were community dwelling (not in a nursing home or long-term care), were willing to be referred, and had one of the following: previous use of the ED services for AECOPD in the past year, admission to QEII HSC Intermediate Care Unit/Intensive Care Unit due to AECOPD in the past year, or admission to hospital more than once with AECOPD in the past year. The QEII Research Ethics Board gave approval for this study. Study patients differed from the majority of those in our regular INSPIRED program in that they were referred from the ED rather than from a hospital floor after an admission for AECOPD, or via other sources such as family doctors. The experience of INSPIRED–ED differed in only minor ways from our regular program (intake data and written informed consent was obtained in person rather than by phone and patients provided some additional demographic information as well as baseline and follow-up Care Transitions Measure-3 [CTM-3]). All other offered services were similar. The INSPIRED-ED program (as for our regular program) was implemented in patients’ homes through a series of educational and support visits (usually up to four and occasionally more) and phone calls over the course of 3–6 months (Box 1). We collected data as follows and report means (SDs) as appropriate. Demographic data: eg, age, disease severity (MRC dyspnea score 1–5),15 FEV1. 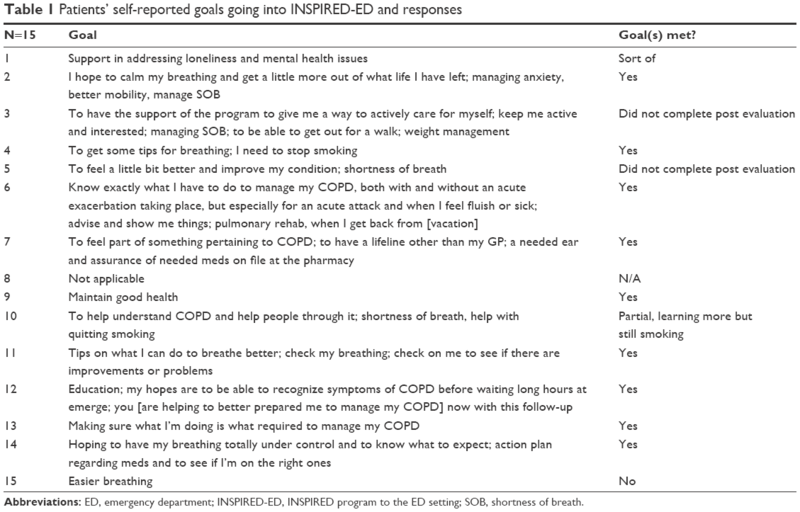 Expectations of INSPIRED using a single open-ended question for patients: “What are your expectations of/hopes for the INSPIRED program?” and at study completion we asked whether their goals had been met. “Helpfulness” of the program. Reflecting our approach in an earlier study,14 in which we described five elements of the program that patients found helpful (access to actions plans, someone to call etc) we asked participants to rate INSPIRED-ED according to five choices that range from “very unhelpful” to “very helpful”. Facility usage (ED visits, admissions) in comparable time periods (6 months8) before and after INSPIRED-ED. Patients enrolled in INSPIRED-ED (n=15, M=4, F=11) between October 6, 2014 and October 5, 2016 were mean (SD) 68 (7) years old, with post-bronchdilator FEV1 of 44.2 (15.5) % predicted, and MRC dyspnea score of 3.8 (0.41). Nine had quit smoking at least 3 months prior to the study, two more recently. CTM-3 improved significantly from a baseline of 8.6 (2.0) to 11.3 (1.3) (out of 12) after completion of INSPIRED-ED (paired t-test, P=0.0004). Of 14 patients providing reponses, 12 (86%) found the program very helpful, and for those setting goals (n=13) all were met for most (n=9), some for three patients and goals went unmet for one (Table 1). Abbreviations: ED, emergency department; INSPIRED-ED, INSPIRED program to the ED setting; SOB, shortness of breath. Referral rate >2/week during the first 12–18 months. Monthly referral rates were 0.5/week or 75 referrals (47 in Halifax over 24 months and 28 in Dartmouth over 12 months). In total 175 patients were eligible during the study period (122 in Halifax, 53 in Dartmouth), of whom 33 (19%) were referred, 15 consented and 15 completed our study protocol (Figure 1). An additional 34 patients were enrolled to our regular program from those ineligible (n=27) or unwilling to participate (n=7) in INSPIRED-ED (Figure 1). 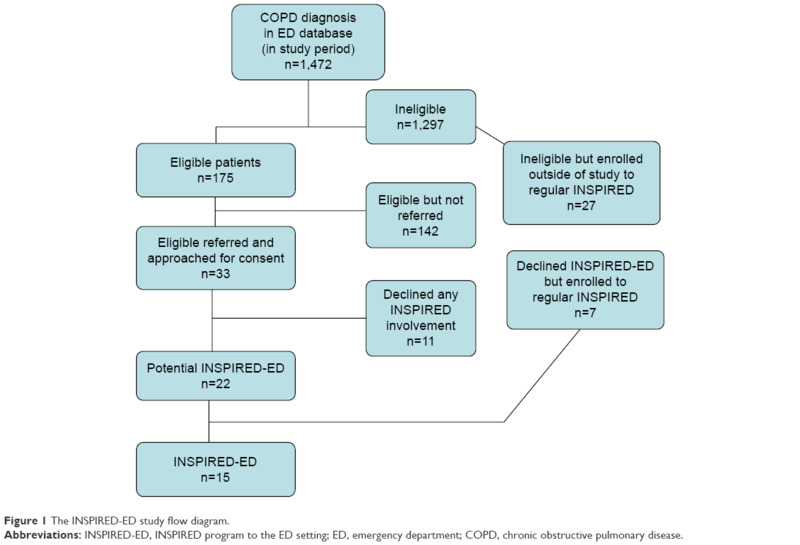 Of 1,472 patients labeled as AECOPD in the ED database during the study period, 1,298 were not eligible (1,021 in Halifax, 277 in Dartmouth) primarily for the following reasons: 1) no prior AECOPD ED visit or admission in the previous year, 2) already being followed by the INSPIRED program, 3) subsequently admitted from the ED, or 4) previous ED visits or admissions were not coded as AECOPD in ED records. Other possible reasons patients were not referred could include patients declining referral, or clinicians determining patient inappropriate for referral. Figure 1 The INSPIRED-ED study flow diagram. Abbreviations: INSPIRED-ED, INSPIRED program to the ED setting; ED, emergency department; COPD, chronic obstructive pulmonary disease. Of the referred and eligible patients 60% were willing to be followed by INSPIRED. Fifteen patients from 33 who were referred and eligible (45%) were willing to be followed by INSPIRED-ED. This compares with an 87.5% rate of willingness to participate rate for non-ED referrals to the regular INSPIRED program (from a convenience cohort of 200 recently enrolled). Of those enrolled in INSPIRED-ED 60% complete the program, including meeting with our SCP to discuss ACP/goals of care and measures as listed earlier. Twelve of the 15 (80%) enrolled in the study completed the program, including meeting with our SCP to discuss ACP/goals of care, 67% (10) completed Personal Directives through the program. Of patients enrolled in INSPIRED-ED 60% will have an Action Plan written by physicians and/or nurse practitioners in the ED during 12–18 months of the program. While 100% of patients for whom it was appropriate received Action Plans, only two received Action Plans written by practitioners in the ED. In a pre-study interview a nurse practitioner working in the ED suggested that it would not be realistic to expect clinicians in the ED to write Action Plans at all due to consistently high volume of patients waiting to see ED clinicians. Our solution was to ask our medical director (GR) to complete them. Of all INSPIRED-ED patients >90% will have an Action Plan. Of patients for whom an Action Plan was appropriate 100% received one. Of the 15 patients who participated in the study, eight received Action Plans through the INSPIRED Program’s medical director (GR), three from a respirologist based at Dartmouth General Hospital, and two through the ED at the Dartmouth General. Two patients did not receive an Action Plan because our respiratory therapy educators determined that insufficient self-management skills precluded use of an Action Plan. A 40%–60% reduction in ED visits (vs previous rate measured over comparable period) for enrolled patients. There was a 54% reduction in ED visits for the 15 study patients (37 ED visits in the 6 months pre-study vs 17 ED visits in the 6 months since the start of the study). Policy makers and stakeholders within Departments of Health, Primary Care, Acute Care settings, and others within the health care system encourage a focus on initiatives for prevention and early disease self-management.17–20 Based on the number of patients coded as AECOPD in the local ED electronic coding system, projections from our successful prior recruitment strategy and outcomes of our original INSPIRED program,8,21 the referral rate to INSPIRED-ED was lower than anticipated. We received 19% (33/175) of potential eligible referrals. This may have reflected our strict referral criteria but also the inevitable reality that the climate of a busy tertiary referral ED is not the ideal setting to recruit patients for community-based follow up (Box 2). Nevertheless, of the 15 who consented to enrollment in INSPIRED-ED, most found the program very helpful, that it met their goals (Table 1) and the significant change in CTM-3 (even in a small cohort) was also in keeping with our overall goal of improvements to patient and family-centered care (Box 1).8 These findings, including the diverse expectations expressed at enrollment, lend support to our individualized community-based approach to the management of COPD. Frequency of ED visits fell by ~50% after INSPIRED-ED as it has in our regular program,8 to the benefit of patients and the health care system. When referral rates were lower than expected, we expanded our recruitment base in October 2015 to a second ED (at Dartmouth General Hospital), and embarked on home spirometry to broaden our eligibility criteria to include patients with a suspected diagnosis that could be confirmed subsequently at home. Throughout we took a pragmatic approach to reflect the real life, busy, stressful environment of the ED. As large EDs become more crowded due to trends in Canada to close smaller facilities, it is unrealistic to expect staff to find the time and commitment to ensure appropriate referral to innovative research or clinical initiatives. A shift in care focus from treatment to prevention mandates either a shift in ED culture (unlikely within years), or more effective recruitment strategies within the ED for an intervention that is worth pursuing. This would require additional implementation work to adapt the intervention to the ED setting. 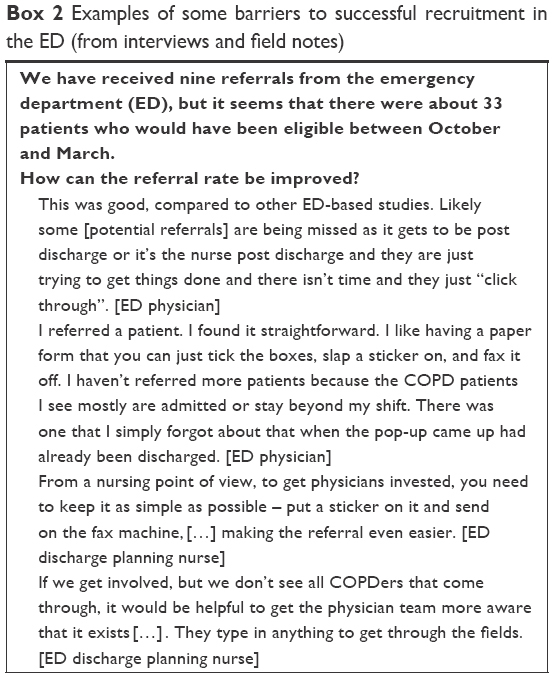 We used pop-up alerts for ED physicians on our electronic systems reminding them about INSPIRED for patients meeting referral criteria and had the chief of the ED advocating for us in ED physician meetings. Nevertheless, our efforts in this regard fell short and ultimately there may need to be a focus on patient recruitment elsewhere within the system. We were pleasantly surprised that more patients than expected were willing to meet with our SCP and complete a personal directive, since we expected patients with less severe COPD to be less open to discussing goals of care. This suggests that discussions of goals of care can be conducted effectively outside of a hospitalization for AECOPD and not limited to patients with severe disease. We also met our targets for action plan completion and reduction in facility reliance. The ~50% reduction in ED visits was similar to that reported previously for our regular program.8 Positive participant feedback and the improvements in care transitions maintain our confidence in the INSPIRED program and in its holistic approach. A recent systematic review reported that reductions in hospitalization at 6 months after self-management programs favored men.22 Women predominated among those recruited to INSPIRED-ED, albeit in small numbers. We have yet to determine whether gender influenced outcomes among the 500+ patients who have been enrolled in our regular program. While AECOPD is the second most common reason for visiting the ED at the QEII, many patients do so infrequently (and thus fall outside of our enrolment criteria) and will tend to have less severe COPD than those enrolled to INSPIRED following a hospital admission, although mean (SD) FEV1 and MRC scores within INSPIRED-ED suggest severity of disease by GOLD 3 criteria.23 It is reasonable to assume that many of the less frequent ED attendees would be mobile enough to attend community-based group sessions if these were offered. This would be a more efficient way to deliver self-management education to those willing to participate. In light of our experience we will explore the feasibility of offering a series of group COPD education sessions within the context of local Community Health Teams (CHT) programming to determine extent of uptake among this patient population. This will complement the ACP education sessions currently offered by our INSPIRED SCPs through the CHTs. The lower than expected number of participants in INSPIRED-ED inevitably limits generalizability of our findings to other EDs or non-admission settings. We did not observe any seasonal effects. We were able to enroll 34 patients to the regular INSPIRED program who were either ineligible or unwilling to participate in INSPIRED-ED (Figure 1). These patients would not otherwise have had the opportunity to benefit from our proactive self-management approach. When combined with the 15 study patients, a total of 49 new patients were enrolled to INSPIRED accounting for 25% of the total INSPIRED enrollment during the study period. An increased INSPIRED overall referral rate of 25% justified the increased staffing support that we secured post-study. This is an important finding for teams considering this approach, and the resources required to support any initiative based in the ED. While recent systematic reviews continue to support the concepts of self-management for patients with COPD,11,22,24 for patients to benefit from “upstream” COPD education, they have to believe in the value of participation at an earlier stage. Overall two thirds of the patients (67%) we approached were willing to consider enrollment in INSPIRED, whether through research or the regular program. This contrasts with the 87.5% rate of uptake among the most recent 200 referrals to the regular INSPIRED program following hospital admission (unpublished data). Focusing resources earlier in the disease trajectory will not be worthwhile if patients with less severe COPD are not interested in participating in COPD self-management education before the health-related implications of their situation become more apparent to them via a hospital admission. Nevertheless, the high proportion of those who participated in INSPIRED-ED and found the program very helpful, suggests self-management education can be appropriate if targeted to those motivated in this direction. Despite the potential value of offering self-management education early in the COPD trajectory, referral rates for INSPIRED-ED were less than anticipated. While outcomes were in general positive, similar to those of our regular program, and we met many of our feasibility targets, it will be important to explore recruitment alternatives to the ED and the extent of interest in self-management more broadly among patients yet to experience the more negative impacts of COPD. Our findings underline the importance of conducting preliminary work to ascertain feasibility of and best settings for implementing new patient self-management education initiatives prior to significant investment in such strategies. The authors thank Sam Campbell MB BCh, CCFP(EM), (Chief, Emergency Medicine); Nikki Kelly BScN, MN-NP, Nurse Practitioner in the ED at the QEII Health Sciences Centre; and Ms Paula Bond MNA, Vice President, Acute Care at the QEII, for their help in the implementation of the INSPIRED-ED project in Halifax, Nova Scotia. They also thank Catherine Simpson PhD and Jennifer Verma MSc BJH for their review of earlier drafts of this manuscript. The INSPIRED-ED project was supported by the Queen Elizabeth II Health Sciences Centre Foundation’s Translating Research into Care Healthcare Improvement Research Funding Program (#892293- 2014). CIHI. High users of hospital beds; 2016. Available from: http://www.cihi.ca/en/health-system-performance/your-health-system-tools/high-users-of-hospital-beds. Accessed May 11, 2017. Hutchinson A, Pickering A, Williams P, Bland JM, Johnson MJ. Breathlessness and presentation to the emergency department: a survey and clinical record review. BMC Pulm Med. 2017;17(1):53. Iyer AS, Bhatt SP, Garner JJ, et al. Depression is associated with readmission for acute exacerbation of chronic obstructive pulmonary disease. Ann Am Thorac Soc. 2016;13(2):197–203. Rocker GM, Simpson AC, Horton R. Palliative care in advanced lung disease: the challenge of integrating palliation into everyday care. Chest. 2015;148(3):801–809. Farquhar M, Moore C, Gardener C, et al. Enabling patient-centred care in advanced COPD: identifying care and support needs. BMJ Support Palliat Care. 2015;5(1):114. Bourbeau J, Julien M, Maltais F, et al. Reduction of hospital utilization in patients with chronic obstructive pulmonary disease: a disease-specific self-management intervention. Arch Intern Med. 2003;163(5):585–591. Bourbeau J, Saad N, Joubert A, et al. Making collaborative self-management successful in COPD patients with high disease burden. Respir Med. 2013;107(7):1061–1065. Rocker GM, Verma JY. ‘INSPIRED’ COPD Outreach Program: doing the right things right. Clin Invest Med. 2014;37(5):E311–E319. Mikkonen J, Raphael D. Social Determinants of Health: The Canadian Facts 2010. Toronto: York University School of Health Policy and Management; 2010. Omachi TA, Katz PP, Yelin EH, et al. The COPD Helplessness Index: a new tool to measure factors affecting patient self-management. Chest. 2010;137(4):823–830. Jonkman NH, Westland H, Trappenburg JC, et al. Characteristics of effective self-management interventions in patients with COPD: individual patient data meta-analysis. Eur Respir J. 2016;48(1):55–68. Campbell M, Fitzpatrick R, Haines A, et al. Framework for design and evaluation of complex interventions to improve health. BMJ. 2000;321(7262):694–696. Rocker G, Young J, Donahue M, Farquhar M, Simpson C. Perspectives of patients, family caregivers and physicians about the use of opioids for refractory dyspnea in advanced chronic obstructive pulmonary disease. CMAJ. 2012;184(9):E497–E504. Rocker GM, Simpson AC, Joanne Young B, et al. Opioid therapy for refractory dyspnea in patients with advanced chronic obstructive pulmonary disease: patients’ experiences and outcomes. CAMJ Open. 2013;1(1):E27–E36. Bestall JC, Paul EA, Garrod R, Garnham R, Jones PW, Wedzicha JA. Usefulness of the Medical Research Council (MRC) dyspnoea scale as a measure of disability in patients with chronic obstructive pulmonary disease. Thorax. 1999;54(7):581–586. Parry C, Mahoney E, Chalmers SA, Coleman EA. Assessing the quality of transitional care: further applications of the care transitions measure. Med Care. 2008;46(3):317–322. Csikesz NG, Gartman EJ. New developments in the assessment of COPD: early diagnosis is key. Int J Chron Obstruct Pulm Dis. 2014;9:277–286. Effing TW, Vercoulen JH, Bourbeau J, et al. Definition of a COPD self-management intervention: International Expert Group consensus. Eur Respir J. 2016;48(1):46–54. Maltais F, Dennis N, Chan CK. Rationale for earlier treatment in COPD: a systematic review of published literature in mild-to-moderate COPD. COPD. 2013;10(1):79–103. Welte T, Vogelmeier C, Papi A. COPD: early diagnosis and treatment to slow disease progression. Int J Clin Pract. 2015;69(3):336–349. Rocker G, Downar J, Morrison RS. Palliative care for chronic illness: driving change. CMAJ. 2016;188(17–18):E493–E498. Jonkman NH, Westland H, Trappenburg JC, et al. Do self-management interventions in COPD patients work and which patients benefit most? An individual patient data meta-analysis. Int J Chron Obstruct Pulm Dis. 2016;11:2063–2074. Global Initiative for Chronic Obstructive Lung Disease. Global Strategy for the Diagnosis, Management, and Prevention of chronic obstructive pulmonary disease (2017 report); 2017. Available from: goldcopd.org/gold-2017-global-strategy-diagnosis-management-prevention-copd/. Accessed May 11, 2017. Zwerink M, Brusse-Keizer M, van der Valk PD, et al. Self management for patients with chronic obstructive pulmonary disease. Cochrane Database Syst Rev. 2014;3:CD002990.